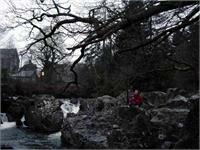 Betws-y-Coed is North Wales' most popular inland resort. It is where the River Conwy meets its three tributaries flowing from the west, the Llugwy, the Lledr and the Machno. Much of it was built in Victorian times and it is the principal village of the Snowdonia National Park. 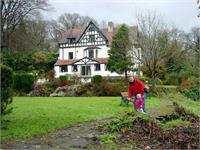 Set in a beautiful valley in the Snowdonia Forest Park, it is ideal for outdoor activity holidays. Numerous Craft and outdoor activity shops are in the village with the popular Swallow Falls nearby. It’s has a wonderful setting surrounded by dense woodland and magnificent mountain country is only part of the answer. The beauty of the area is enhanced by cascading waterfalls, hill-top lakes, river pools and ancient bridges. Ever since the Victorian artists flocked to the area and formed the first artist colony it has been a mecca for those that appreciate its unique natural beauty. Fire crews have been at the scene for almost 24 hours. Heading to Snowdonia National Park this weekend for some peace, tranquility and space to think among the mountains?